BACKGROUND: Obesity and undernutrition are common in South Africa and influence the health outcomes of people living with the human immunodeficiency virus (PLHIV). Aim. To describe the anthropometric changes and perceptions of body weight in adults initiated on antiretroviral therapy (ART). METHODS: A cohort of 230 PLHIV was enrolled at an HIV clinic in Durban. Changes in their body mass index, and waist and hip girth were measured 6-monthly in the 12 months following initiation of ART. Data on demographic and socio-economic variables, CD4 counts, opportunistic infections and drug regimens used were recorded. Perceptions of body weight and desire to change these were ascertained. RESULTS: Weight perceptions of respondents were incongruent with their body mass index, with the trend being to judge themselves as weighing less than their actual weight. Those wanting to gain weight gained an average of 7.8 kg - 2.8 times more than those satisfied with their weight (p<0.001). After 12 months on ART, there was a statistically significant increase in anthropometric measurements (p<0.001) with 43 of the 110 women having waist circumferences that increased their risk of cardiovascular disease; the incidence of lipodystrophy was 35% (62/177) (95% confidence interval 27 - 42%), 36% (64/177) were overweight and 22% (39/177) were obese, compared with 21% (49/230) and 12% (28/230) respectively at baseline (p=0.002). CONCLUSION: There is a strong association between PLHIV's perception of body weight, their desire to gain weight and their actual weight gain on ART. Lipodystrophy, weight gain and truncal obesity are common among PLHIV after initiating ART. We studied the evolution of anthropometric markers and perceptions of body weight in adults living with HIV in the first 12 months after initiating ART at an HIV clinic in Durban to determine predictors of these changes in order to improve nutritional and healthy lifestyle promotion. Since weight perceptions are likely to influence weight gain, we studied patients' body weight perceptions and their aspiration to gain or lose weight, and compared these with their actual anthropometric changes. 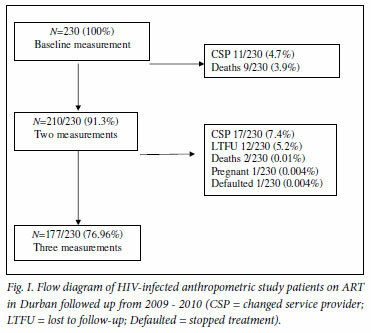 We used an observational, descriptive cohort study design, and enrolled 230 consecutive HIV-positive outpatients initiating ART between June and October 2009 and followed them up for 12 months at the Sinikithemba HIV Clinic at McCord Hospital in Durban. This is a state-aided, semi-private, urban hospital where patients pay R140 (US$20) monthly for comprehensive HIV care, including psychosocial support to improve adherence and nutritional advice to promote a healthy lifestyle. ART-naïve adults between the ages of 18 and 50 years commencing ART were included. Pregnant women and those unable to speak isiZulu or English were excluded. Approaching all eligible patients for recruitment during the study period minimised selection bias. Only 5 declined. Height, weight, and waist and hip measurements were measured at baseline and the latter three again at 6 and 12 months. Baseline demographic data and health status variables including CD4 count, haemoglobin level, co-morbid illnesses, opportunistic infections including tuberculosis, and drug regimens used were obtained from medical records. Drug substitutions, inter-current opportunistic infections, CD4 counts and viral load were recorded at 6 and 12 months. A questionnaire, administered by a trained isiZulu-speaking research assistant, was used to collect data on income, education level, number of dependants and the respondents' perceptions of body weight, desire to change this, and reasons for wanting to change. Information bias was reduced by in-depth training and weekly supervision of field workers by the hospital dietician. Measurement bias was reduced by using calibrated instruments and standard anthropometric techniques. Height was measured using a wall-mounted stadiometer. Subjects were weighed without shoes and in minimal clothing, with a calibrated electronic scale to the nearest 0.1 kg. Waist and hip circumference were measured to the nearest 0.1 cm using a flexible, non-elastic tape measure (Seca) with the patient standing upright with feet together and arms at their sides. Waist measurement was measured at the mid-point between the lowest rib and the iliac crest, and hip circumference as the maximal circumference over the buttocks. Both were performed twice and their mean was calculated. BMI was calculated in kg/m2 and categorised as underweight (BMI <18.5), normal (18.5<BMI< 25), overweight (25<BMI<30), and obese (BMI>30). WHR was calculated as the ratio of the waist girth to the hip girth. Lipodystrophy was diagnosed with a WHR >0.95 in males and >0.85 in females or if other characteristic changes associated with lipodystrophy, including truncal obesity, enlarged breasts, buffalo hump and peripheral wasting in the buttocks, limbs and face, were reported. A WC >88 cm in women and >102 cm in men identified those at increased risk of cardiovascular disease. Active tuberculosis (TB) was recorded if TB had been diagnosed within the 3 months before initiating ART or during the 12-month study period. Data were analysed using SPSS version 15.0 (SPSS Inc., Chicago). Baseline characteristics were compared between males and females using non-parametric Mann-Whitney tests in the case of continuous non-normally distributed or ordinal variables and Pearson's chisquare tests for categorical variables. Associations between predictor variables including time and the anthropometric change were assessed using population averaged generalised estimating equation (GEE) models to account for some missing data at 6 and 12 months' follow-up. Age, gender and other socio-economic variables and the presence of TB were controlled for in the analyses by using them as covariates or factors in the models. Exchangeable correlation matrices were specified. 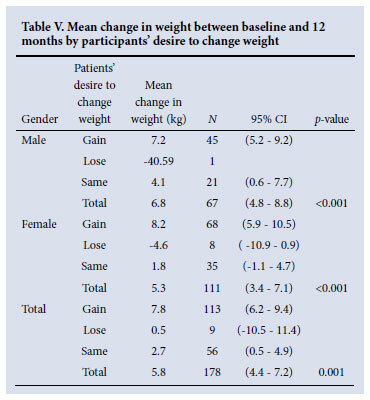 One-way analysis of variance (ANOVA) tests compared mean weight change over 12 months with the respondents' desire to gain weight, lose weight or remain the same. The University of KwaZulu-Natal Biomedical Research Ethics Committee (BF 154/08) and McCord Hospital provided ethical approval for the study. Written informed consent was obtained from participants. The cohort comprised 230 black PLHIV commencing ART, of whom 144 (63%) were female; their median age was 35 years (interquartile range (IQR) 29 - 39). TB was diagnosed in 90 (39%) in the 3 months before initiating ART and in a further 30 (13%) in the 12 months thereafter. The median baseline CD4 count was 97 cells/ mm3 (IQR 44 - 169); 65 (28%) patients had a CD4 count <50 cells/ mm3. Twenty-three (10%) patients were underweight (BMI <18). All participants were initiated on standard stavudine- and lamivudine containing regimens with 206 (90%) on efavirenz and 24 (10%) on nevirapine as the third drug (Table I). Of the 230 enrolled patients, 210 (91%) had 2 sets of measurements recorded, and 177 (77%) had anthropometry at all 3 time points (Fig. 1); 28 (12%) changed their service provider, 12 (5.2%) were lost to follow-up, 11 (4.8%) died, and there was one pregnancy and one defaulter. 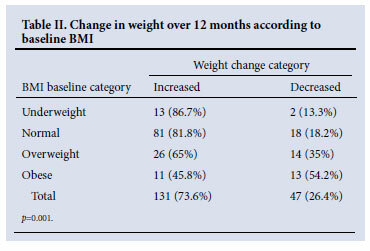 One hundred and thirty-one (74%) gained weight, and those who were underweight at baseline (13/15, 87%) had the highest proportional increase (Table II). The mean baseline BMI was 21.9 kg/m2 for males and 25.0 kg/ m2 for females. BMI increased significantly over time with a mean increase of 2.4 kg/m2 (95% CI 1.7 - 3.1) between baseline and 12 months in males (p<0.001) and 2.2 kg/m2 (95% CI 1.5 - 2.9) in females (p<0.001) (Table III). Increase in BMI was positively associated with age (p=0.001) and negatively associated with current TB in females (p=0.018) (Table IV). After one year on ART, 64 (36%) of the remaining cohort (177) were overweight and 39 (22%) were obese compared with 49 (21%) and 28 (12%) respectively at baseline (p=0.002). The mean baseline weight was 63.6 kg for males and 63.5 kg for females. Weight increased significantly over time (p<0.001) with a mean adjusted increase of 6.8 kg in males and 5.6 kg in females between baseline and 12 months (Table III). Increase in weight in these females was positively associated with the age of the study participant (p=0.008) and negatively associated with them currently having TB. 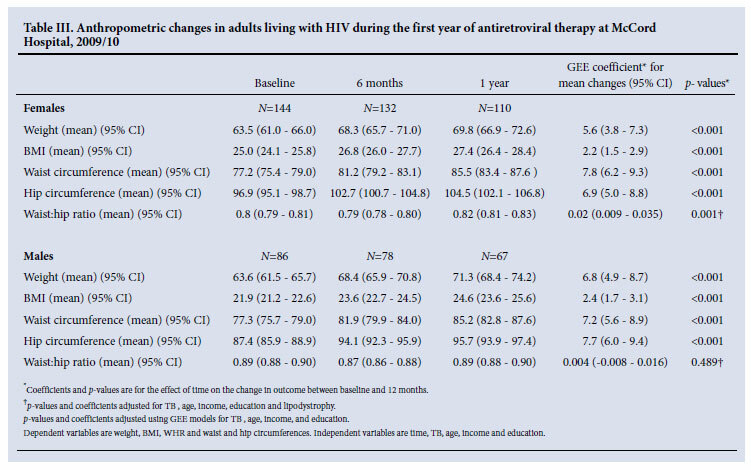 Females who started ART with TB and those who developed TB during the study period both gained significantly less weight in 12 months (6.2 kg less, p=0.021 and 6.5 kg less, p=0.015 respectively) compared with those who did not have TB, after controlling for age, education level and income bracket (Table IV). Among patients who wished to gain weight, 83% (94/113) achieved this with a mean increase of 7.8 kg. Of those who wanted to stay the same weight, 60.7% (34/56) gained, with a mean weight gain of 2.7 kg (Table V). The mean baseline WC was 77.3 cm for males and 77.2 cm for females. WC increased significantly over time, with a mean increase of 7.2 cm in males and 7.8 cm in females between baseline and 12 months (p<0.001) (Table III). Increase in WC was positively associated with age in women (p=0.003) and men (p=0.006) (Table IV). There was a significantly higher proportion of women (39.1%, 43/110) with WC >88.0 cm compared with men, in whom 5 (7.5%, 5/67) had a WC >102.0 cm after 12 months of ART (p<0.001). The mean baseline hip circumference was 87.4 cm for males and 96.9 cm for females. Hip circumference increased significantly, with a mean increase of 7.7 cm in males and 6.9 cm in females between baseline and 12 months of ART (p<0.001) (Table III). Increase in hip circumference in females was positively associated with their age (p=0.017) and negatively associated with having TB (p=0.04) (Table IV). The mean baseline WHR was 0.89 in males and 0.80 in females (Table III). Overall, 62 (35%, 95% CI 28 - 42%) of the participants developed lipodystrophy within 12 months of commencing ART. Of these, 50 participants (81%) were diagnosed according to WHR measurements and 12 (19%) were according to self-reported symptoms. Nine (15%) of the 62 who developed lipodystrophy according to their WHR were not diagnosed by the attending clinician or reported by the participant. 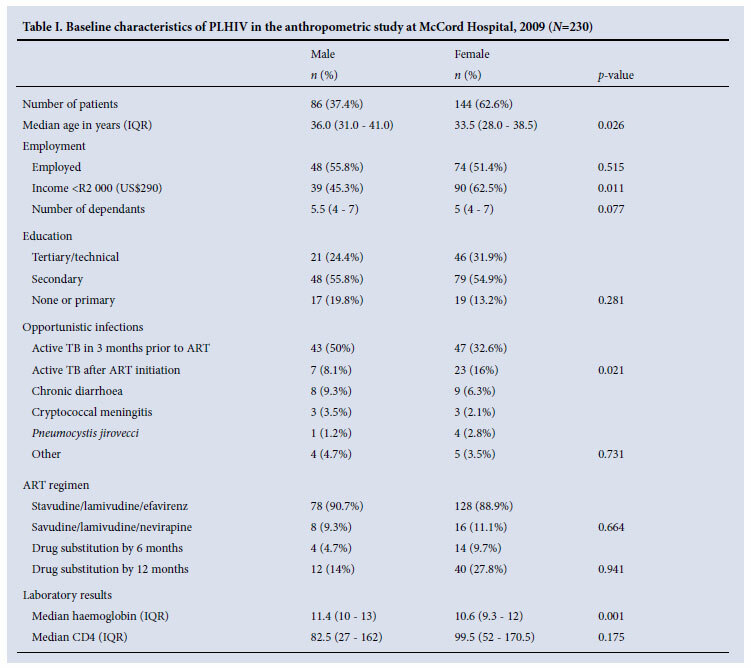 There was a significant increase in WHR of 0.086 (95% CI 0.065 - 0.107) in males and 0.082 (95% CI 0.065 - 0.1) in females who developed lipodystrophy (p<0.001) (Table IV). At baseline, 93 (40%) of all participants felt that they were underweight, 117 (51%) said that they were 'just right', and 15 (6.5%) that they were overweight. Baseline weight perceptions were compared with actual baseline BMI categories and, of those who were underweight, 74% (17/23) assessed themselves correctly. In those with a normal BMI, 46% (59/128) assessed themselves as being underweight, and 53% (68/128) felt that they were just right. In the overweight BMI category, 61% (30/49) felt that they were just right and 25% (12/49) assessed themselves as being underweight. Among obese patients, 26% (7/27) felt that they were overweight, 19% (5/27) that they were underweight, and 48% (13/27) that they were just right. Therefore, respondents' perceptions of their weight were not congruent with reality, the trend being to judge themselves as being less than their actual weight, which was not objectively accurate (Table VI). Regarding their desire to change their current weight status, 152 (66%) (N=230 at baseline) wanted to gain weight, 9 (3.9%) to lose weight, and 69 (30%) to remain the same. 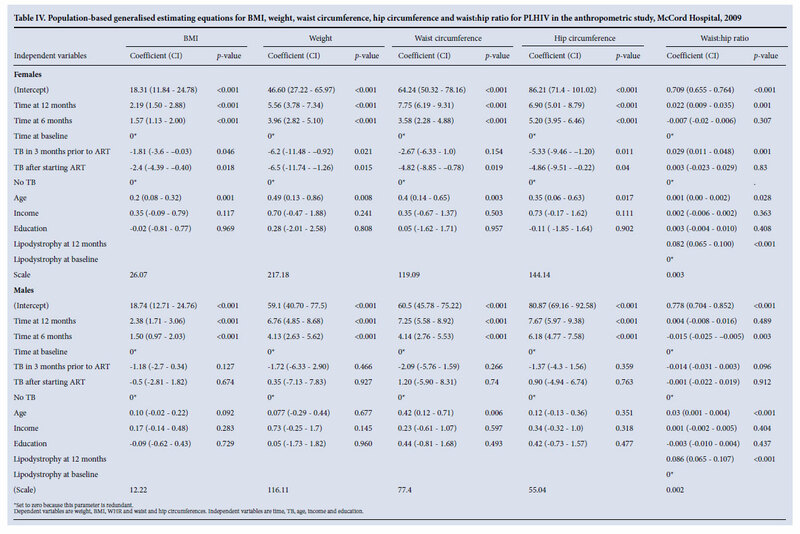 Correlating desire to gain weight with actual baseline BMI, only 13% were underweight, 64% were in the normal BMI category, 18% were overweight, and 5% were obese. Among those wanting to remain the same weight, 48% were in the normal BMI category, 28% were overweight and 22% were obese. The main reasons given for desiring to change weight included wanting to return to their 'normal weight' (55%), to be 'healthy' (45%), problems with ill-fitting clothing or finances related to purchasing new clothes (29%), stigma surrounding HIV (24%), and feeling unhealthy (8.7%). Our findings build on studies of anthropometric evolution in PLHIV on ART in South Africa and on studies of patients' perceptions of their weight and how these influence weight gain.7,15 We aimed to describe anthropometric change in a larger South African cohort of PLHIV along with their perceptions regarding body weight. Potential confounding factors, including TB, age, socio-economic status and education levels of participants, were controlled for in the GEE analyses. Possible limitations to the study are that McCord Hospital is a semi-private hospital that may serve a different socioeconomic group to PLHIV obtaining ART from Department of Health clinics, which could compromise the generalisability of the data. Intensive training and close supervision of the 3 enrolled nurses who conducted the anthropometry should have reduced the inter-observer bias. More research is needed into effective counselling methods to understand and address perceptions regarding weight that are applicable in the existing local cultural context. The stigma that surrounds HIV and incorrect concepts of 'health' and what is considered 'normal' weight remain driving factors in the desire that PLHIV have to gain weight. Educational campaigns and community involvement must be mobilised to bring about change in this area. The need for a greater emphasis on lifestyle and dietary counselling for PLHIV on ART, by providers (including counsellors, nurses and doctors) is highlighted. Lipodystrophy (as an adverse drug effect of stavudine) has a high incidence and must be actively screened for, although this should become less of a problem in the future, with the new national ART guidelines recommending a change from d4T to TDF. Baseline and sequential waist and hip measurements are strongly recommended for all PLHIV initiating ART. Acknowledgement. We thank the McCord dietician Mary-Jane Boyle, Angeline Sibisi (research assistant), Jasper Pons (data base solutions) and the staff at Sinikithemba for their contributions to this research. This study was supported by funding from the National Research Foundation.